This photo was taken on January 15, 2019 at 1:20 PM. The location was in a large center courtyard at the Ronald Reagan Building. The "Take It!” came as I came upon this very familiar to me sculpture. I had walked by it as a part of my routine route on a year round basis for many years and never thought of it as something to possibly ride. There just was not a hint of rideability attached to a tulip like flower laying on its side no matter how pleasant to the eye this art work was. Talk about "Flower Power" lol. For those who visit the city - this out of the way place - has been used many times for presentations and small musical performances. There is actually a matching sculpture to the one shown - but it did not have the sun on it the way this one did - when I happened upon it. Here is hoping your winter has been going well. PS: This could have easily had several different titles (An Impulse Frozen in Time) (Cool it!) etc - lol. Oooo I like An Impulse Frozen in Time...sounds like a movie title or something. It actually took me a second to see the snow. My eyes fooled me into thinking it was part of the sculpture. Not to take anything away from your photo because it is cool, but I never really understood modern art. That monument for example, I have no clue what I’m looking at. Waves maybe? It does look like a flower turned sideways! 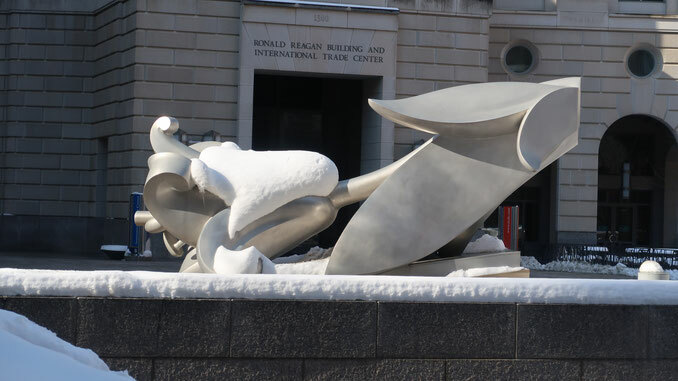 Is the Ronald Reagan Building DC’s World Trade Center? I believe we went there on one of our school trips. I seem to remember security being very tight.